Jim West has a meme going Twitter Theology That Makes Me Sigh. Tumblr is also a place where you can find lots of bad theology, from wannabe atheist thinkers and Christians alike. 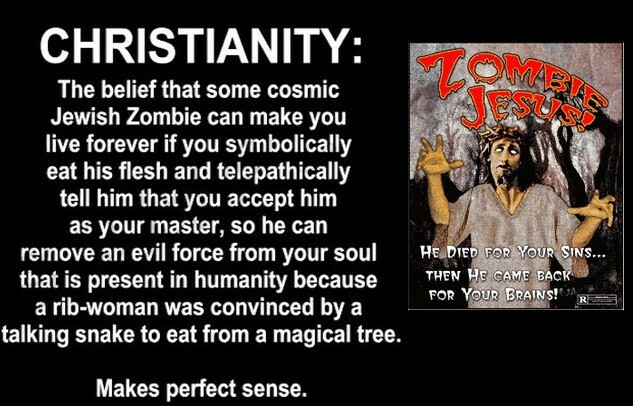 On tumblr there’s a meme for Zombie Jesus, I know sooooo original. What these amateurs don’t know is that the black people who first wrote zombie stories, were Catholic Christians, living in the Carribbean. Enjoy being polemical tools! This entry was posted in Political Jesus and tagged bad theology, Tumblr, Uncategorized, zombies on March 25, 2013 by Rod T.